Our History - Harriet Tubman Foundation of Howard County, Inc.
in 1948. The site selected originally was located in Jonestown. Later, it was agreed that the school would be built in Atholton, where the building is still located. The name originally planned for the school was the Atholton High School. The colored community wanted another name for the school. Several names were submitted however, Harriet Tubman was selected in honor of a Maryland native who led hundreds of slaves to freedom. 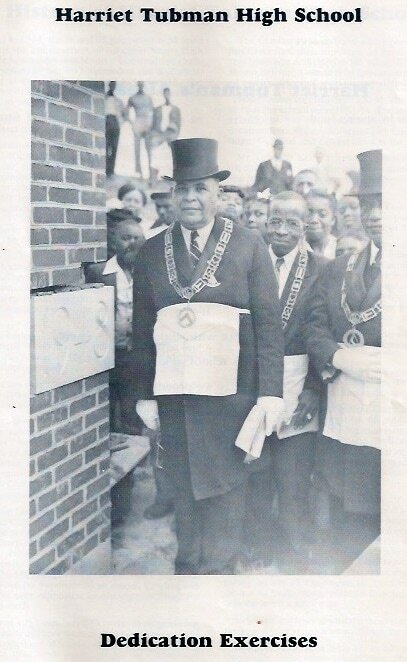 The corner stone was laid on September 25, 1948. The school opened in September 1949, with 12 teachers and a principal. There was no graduation exercise held during 1949-1950, since the 12 year program had not been fully implemented. The first class to graduate from Harriet Tubman High School was in 1951 and the last class to graduate was in 1965. Mr. Silas E. Craft was the principal from 1949 until 1956 and Mr. Elhart E. Flurry was the principal from 1956 until 1965. Mr. Elhart E. Flurry and Mr. Nathaniel Gibson were the two faculty members who started with the opening of Harriet Tubman and remained until the school closed in 1965. 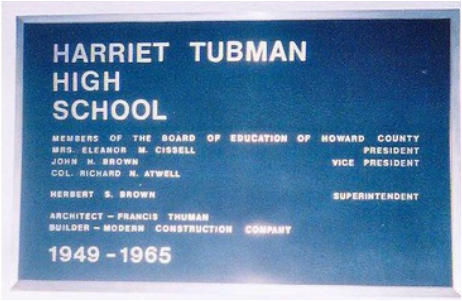 The name Harriet Tubman High School was never placed on the school building. In 1953 with the assistance of the PTA, a brick wall was erected in front of the building and the name Harriet Tubman Jr.-Sr. High School was installed.